Similan Island is recently ranked as one of the world’s top ten diving destinations by National Geographic Society. With crystal clear water and spectacular coral reefs providing an excellent setting for snorkeling. • 08.00 Get Ready – Check in at Love Andaman private pier (Tablamu). Enjoy warm bread, tea and coffee then receive a briefing from beloved eco-alert tour guide. • 09.00 Let’s Start – Hop on first-class speedboat and heading for Similan Islands. 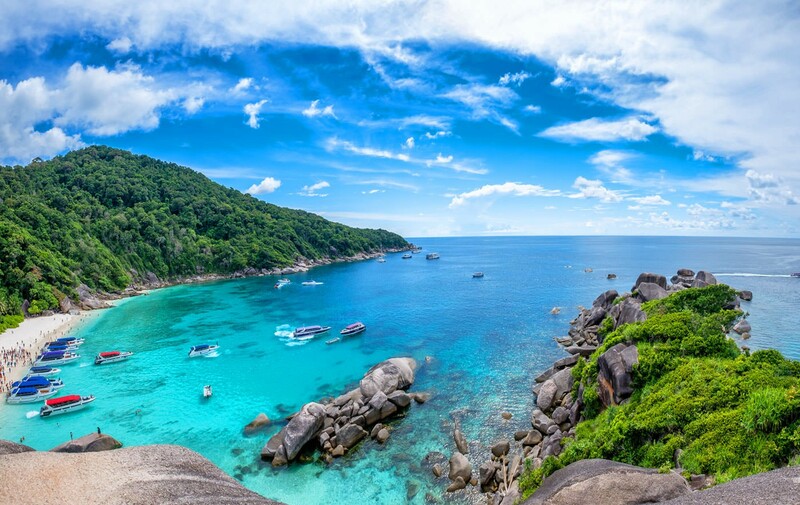 • 10.00 Donald Duck Bay Similan Island – do some hiking to the famous symbolic sail-rock for some amazing scenery and worth a 100+ likes Instagram shot. After the hike, white sandy beach is perfect for relaxing, swimming and sunbathing for beautiful sin-kissed skin. • 11.00 1st snorkeling spot at Ba Ngu Island – Explore the breathtaking Coral Bay, the best place to see all different kinds of fish in colorful sightseeing underwater world. • 12.00 Lunch Time – Enjoy a home cooked delicious Thai lunch buffet with chicken and fresh fruits on Thailand’s most beautiful white sandy beach. • 13.00 2nd snorkeling sport – next station, Finding Nemo!, depart for the 2nd snorkeling point at Payu Island where sea turtles and clown fish (Nemo) are often sighted. • 14.00 Take a rest at Mieng Island – Head to the gorgeous beach of the Honeymoon Bay & princess Bay for more scenic photos and relaxing time. • 16.30 Back to the hotel – Arrive safely at the pier and get on a transfer back to the hotel with a backpack full of wonderful memory, salty hair and new tan skin. • For the safety, the daily program can be changed without prior notice due to weather and sea condition. • Please ask for special meal requirements for vegetarian food and specific allergies.